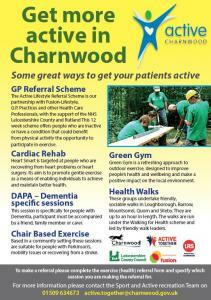 The Active Lifestyle Referral Scheme is our partnership with Fusion-Lifestyle, G.P. Practices and other Health Care Professionals, with the support of the NHS Leicestershire County and Rutland. The scheme offers people who are inactive or have a condition that could benefit from physical activity the opportunity to participate in exercise, including gentle exercise to music, circuits, aqua aerobics, gym based sessions, walking, Zumba gold and t'ai chi. Our referral period is 12 weeks, during which you will have the opportunity to speak with our team on a one-to-one basis to improve both your fitness and general well-being. You will be monitored during this period, and the resultant statistics taken will be referred back to your GP at the end of the 12 week period. To join the scheme you need to visit your GP, a Practice Nurse or another Health Care Professional. You can also be referred to us if you are undergoing a Fit4work review. If you are eligible and the scheme is considered appropriate the health professional will complete a referral form for you, which will be sent our Active Lifestyle Development Officer. You can be referred to join our walks programme (in which case your health professional must specify that they are referring to the walk programme), to one of our Leisure Centres, or to a community venue within Charnwood.